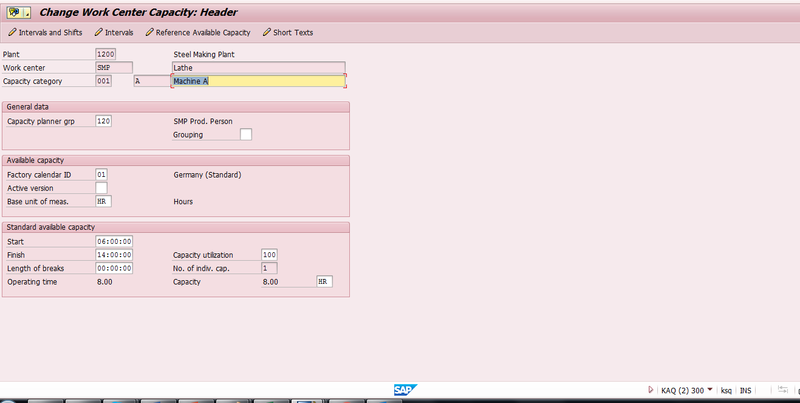 Welcome to the tutorial about SAP Work Center Capacity. This tutorial is part of the SAP PP training course. You will learn what is capacity in SAP PP, how to use capacity categories, the difference between available and required capacity, intervals of available capacity, usage of shifts in capacities and individual capacities. Also, we will discuss different units of measure for capacities and cumulation of capacities in hierarchies of work centers. Capacity means capability to do certain work. 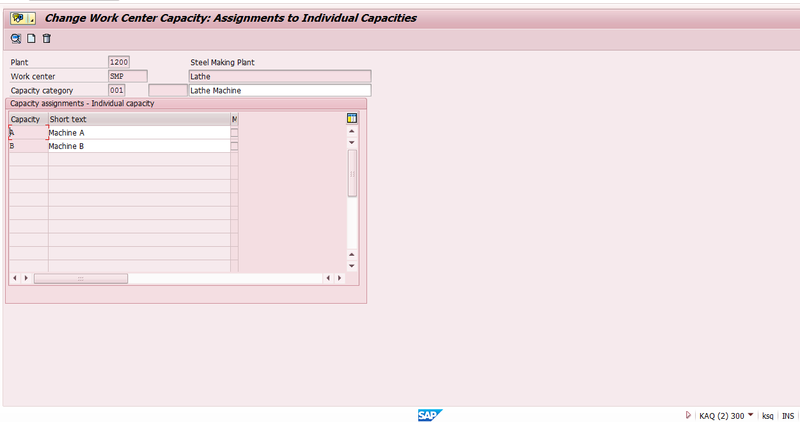 In SAP, capacity is closely related with work centers, i.e. 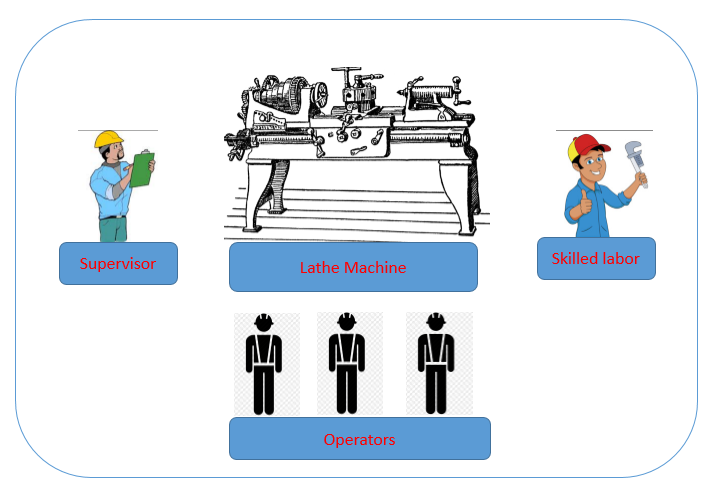 capability of a work center/machine to do certain operations. In general, capacity will be measured in “Time” unit. We can also use other units of measure depending on production business processes. We can assign an HR object to a work center which will be helpful for determining qualification of an employee. For example, certain operations might need special skillsets like CNC Operator/programmer. We can assign this information to the work center. When a particular machine/work center is scheduled in PM order for maintenance activities, its capacity will be locked for production uses. Machine 9 1 9 Hrs. Labor 9 3 27 Hrs. In general, capacity means available hours of a machine or labor. These available hours excludes breaks or halt hours. Capacity formula. It uses standard value key parameters (Basic tab of work center master data screen). Operation time in a production order. It uses time defined in routing operation for the base quantity. It is also possible to have several similar machines to increase the capacity. 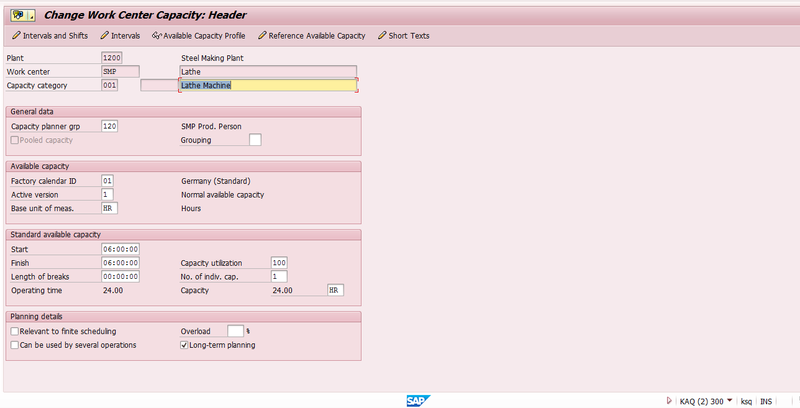 SAP has a field called “Number of Individual Capacity”. This is number of individual machines available with similar capacity. 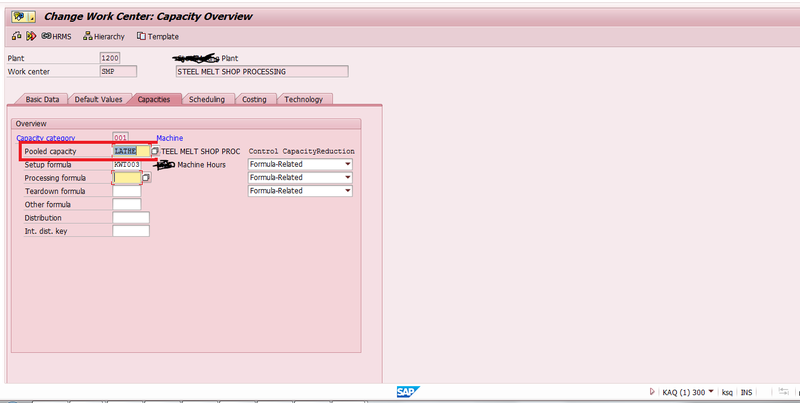 When the SAP system calculates required capacity, it divides the amount to the number of individual capacities in formula. 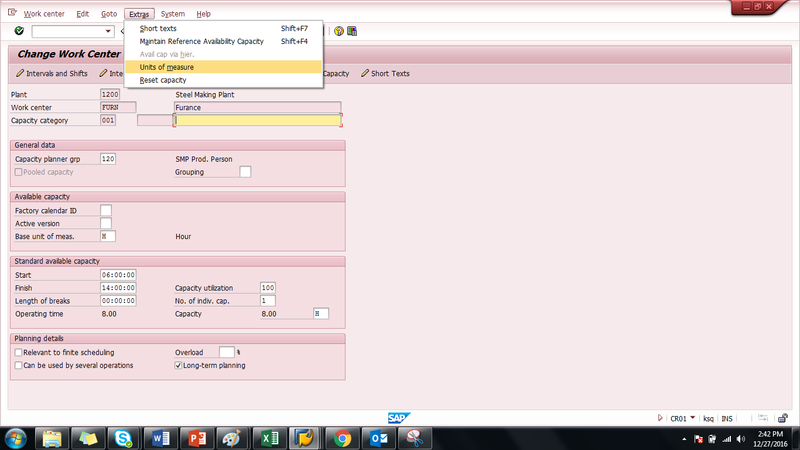 When the SAP system calculates available capacity it multiplies the amount to the number of individual capacities. 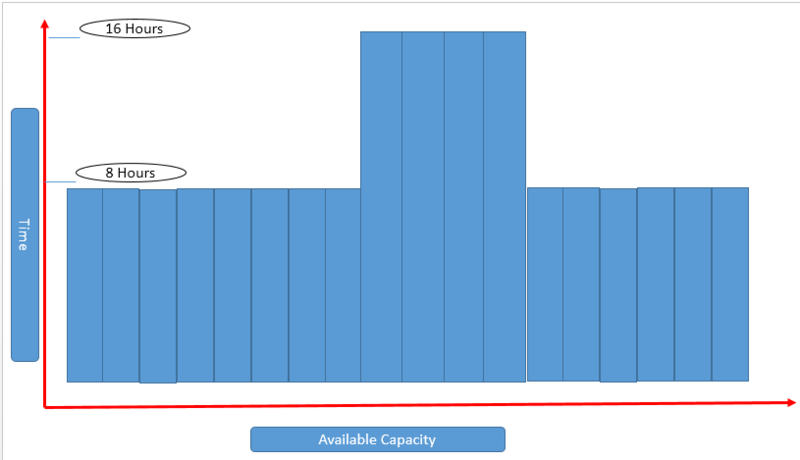 Work centers which are having same capacity type can be assigned with a pooled capacity. This capacity is defined globally and assigned to the all work centers. For example, let say you have 7 lathe machines with similar capacity. 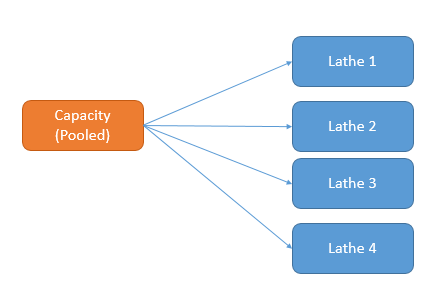 Pooled capacity can be created by accessing following menu path. Once a pooled capacity is created (in transaction CR11), it can be assigned to a work center in transactions CR01/CR02 in Capacity tab. When standard available capacity of a machine needs to be replaced for certain periods, we can use interval available capacity. For example, a work center which has the standard available capacity of 8 hours per day but from 20 June to 28 June due to higher demand a company wants to run this machine for 16 hours per day. In this case we can define the interval of capacity for these period as 16 hours. 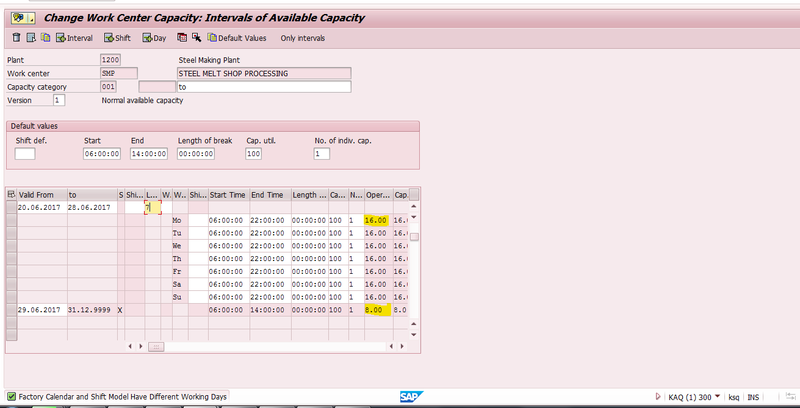 To create an interval of available capacity, go to the header part of a capacity (transaction CR11). Next, click on button. The system will add a new line for the interval. Now press Enter button on the keyboard. Here, you can find that during the period from 20 June to 28 June (interval of capacity) available capacity is 16 hours, whereas for rest of the days it is 8 hours (standard available capacity). Capacity and planning calculations can also take into account shifts. 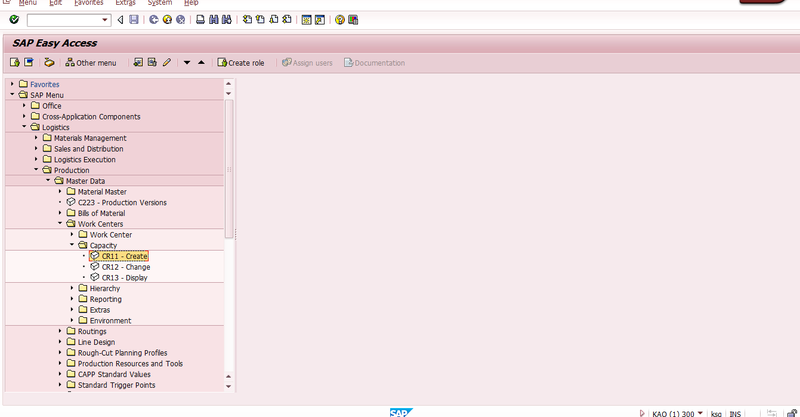 Let’s see how to define shifts and breaks in SAP. Shift definition will be maintained as show on the picture below. Shift definition in SAP is part of customizing activity which needs to be performed in the transaction OP4A. Next, we should define the sequence of our two shifts. The sequences of the shifts are defined in the same transaction as shown on the picture below. Additionally, we can define break times for each shift and assign them in shift definition later. 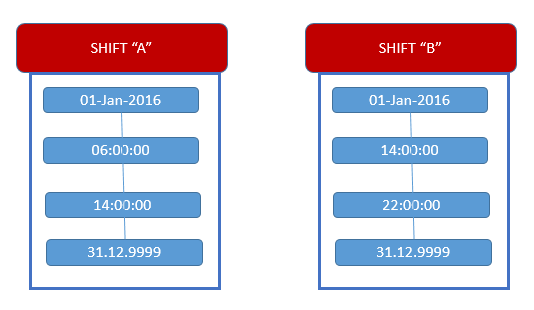 Shift timings and breaks will be used at the time of capacity and scheduling calculations. By default, the SAP system schedules the break time to be distributed equally over the working hours. When we want the system to uses exact break times defined in the shift the indicator “Scheduling with Break” needs to be maintained in the production order type. Note: this topic will be discussed in more details in the tutorial about production orders. 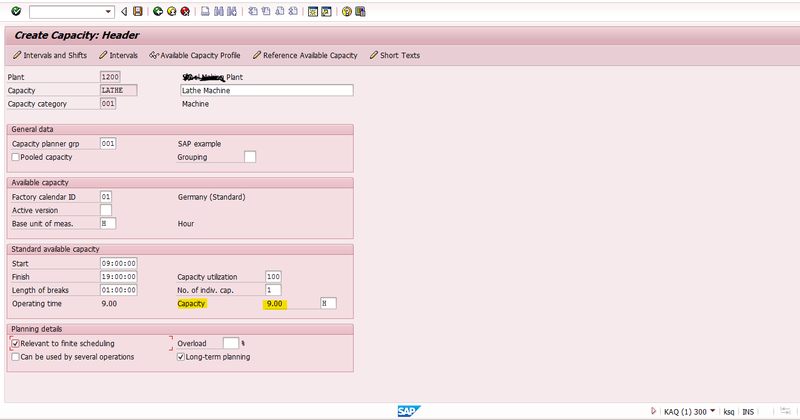 To see how it works in SAP, go to the transaction CR11. Select each item in the list and click on button. 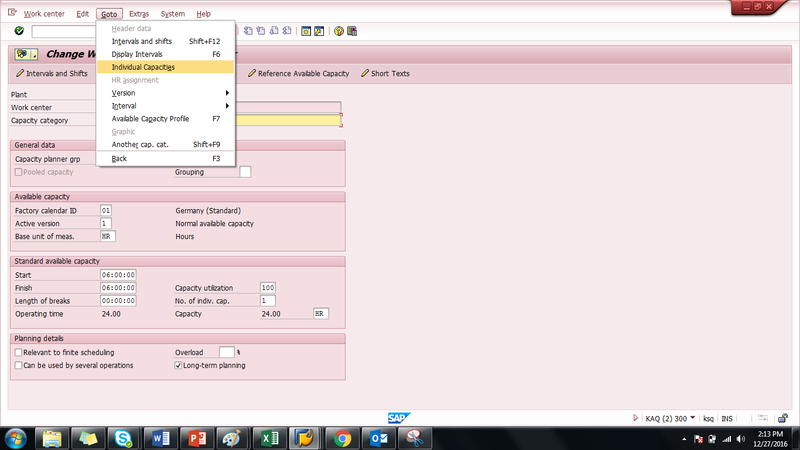 The SAP system will show individual capacities for machines A and B. 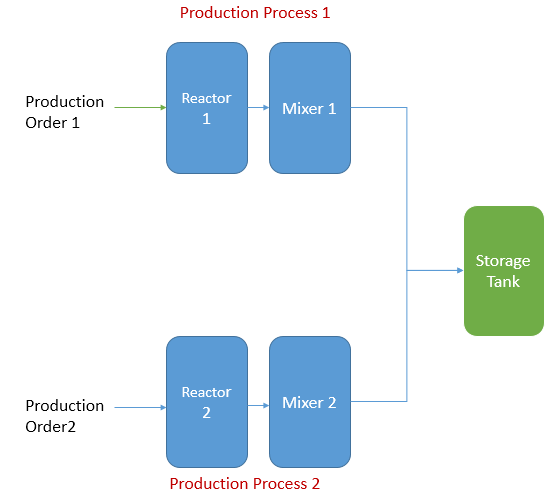 When creating a production order it will be necessary to assign the individual capacity that we are going to use to perform the operation. In general, capacity is defined in the unit “Hour”. But there may be a case when a different unit of measure (UOM) can also be maintained. UOM may be Cubic Meter (M3) or KG or TON, etc. For an example, let’s consider the casting industry where casting is formed from molten metal from furnace. Here furnace capacity can also be defined in “TON”. But the relation between TONs and Hours must be maintained in the work center capacity. This will be used to evaluate the capacity in TONs. Capacity can be cumulated by means of work center hierarchy. Hierarchy of work center enables cumulation of available capacities from child work centers to their superior work center. Dynamic cumulation is used to cumulate both available capacity and required capacity, whereas static cumulation cumulates available capacity of a hierarchy of work centers. In static cumulation, cumulated available capacity of a superior node will not be changed automatically when there is a change in the available capacity of a subordinate work center. So, we must cumulate available capacity periodically. 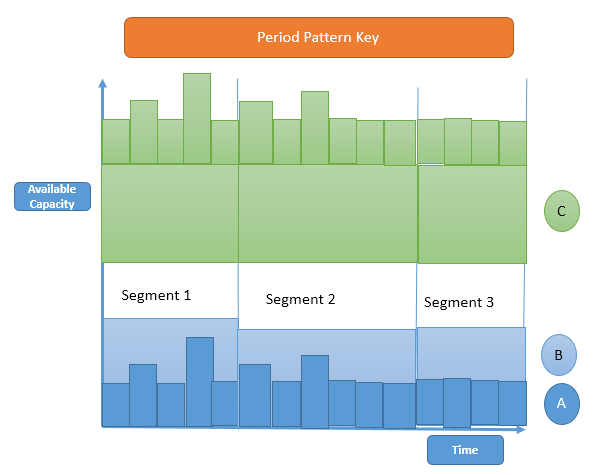 Definition of Period pattern key is part of customizing activity using transaction OP11. Let’s image that you want to cumulate available capacity as three segments on the time axis. The first segment, cumulate next 7 days of available capacity. The second segment, cumulate next 3 weeks from last period of the segment 1. The third segment, cumulate 1 month of available capacity from the last period of the segment 2. 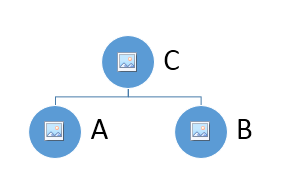 Work center Hierarchy for the above diagram is as shown on the picture below. Here, available capacity of work center A and B are cumulated in a higher hierarchy. That is, cumulated available capacity is displayed in available capacity of the work center C.
Creation of a period pattern key is part of customizing activity in the transaction OP11. Periods in a period pattern key may be work days, calendar days, weeks, months or years. Let’s say that available capacity of SAP work center A is 12 Hours and work center B is 18 hours. Then, available capacity of work center C will be calculated as 30 hours. If period pattern key is defined as a week, then available capacity for a week will be cumulated. In dynamic cumulation, the SAP system cumulates the available capacities and the capacity requirements for all capacity categories of the work centers specified in a hierarchy. This is defined in Option Profile which is part of customizing activity for the case of available capacity cumulation (transaction OPA3). This is defined in Evaluation Profile which is part of customizing activity for the case of required capacity cumulation (transaction OPD0). Let’s consider the same example given for the static cumulation. 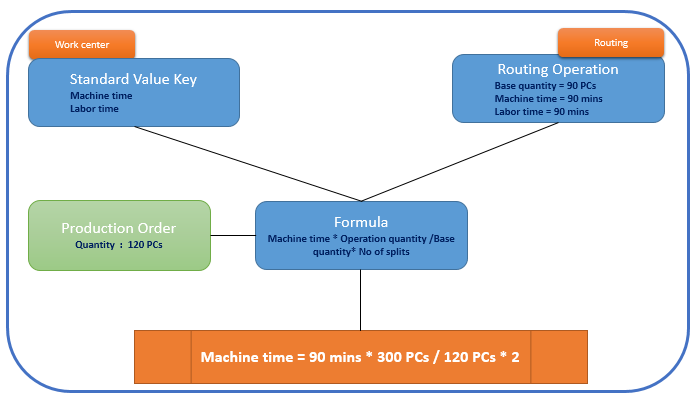 When Lathe machines are loaded with capacity by order (say 4 hours each), dynamic capacity cumulation cumulates this required capacity (4 hours + 4 hours) into the work center hierarchy C as 8 hours. This will be discussed in more details in capacity requirement planning tutorial. 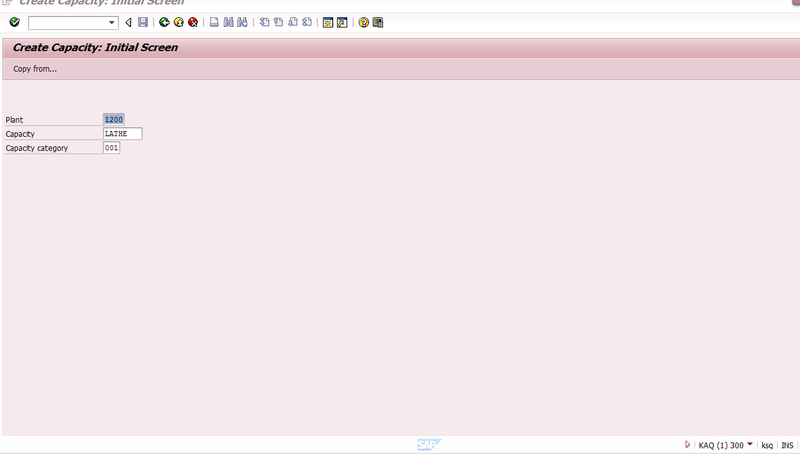 Finally, let’s discuss several important checkboxes in SAP work center capacity master data (transaction CR11). 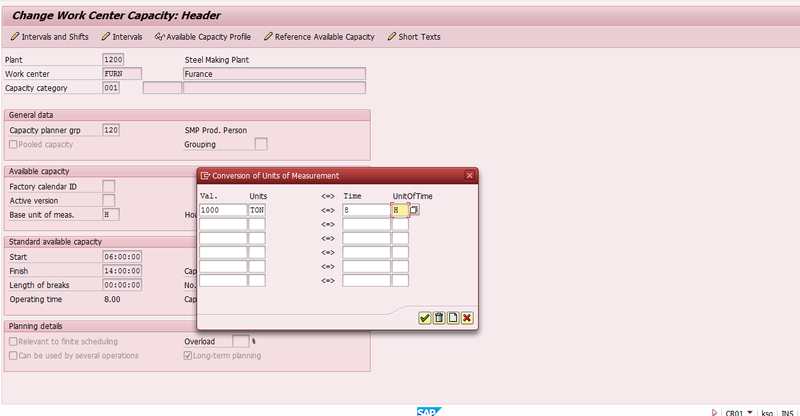 When this Indicator is activated the SAP system considers the existing capacity load while calculating available capacity. Let’s say Machine ‘A’ which has available capacity of 8 hours was scheduled for an order on 10 July for 4 hours 30 mins. When a new order is created for this machine on same date, the system will propose only remaining hours (3 hours 30 mins). When this Indicator is activated, that particular work center capacity can be utilized by more than one operation. This allows the SAP system to consume the available capacity for other production orders. For example, let’s say you defined a storage tank as a work center in the chemical industry. When two production orders try to use this storage tank to fill the finished chemical, the SAP system will only allow this when this indicator is activated. When this Indicator is activated, this work center capacity can also be used to calculate capacity requirement of long term planning. Note: long term planning in SAP is also called simulation MRP where we can upload demand simulation to calculate required raw materials and capacity for an assembly/subassembly. IT WOULD BE SUPERB IF THE TUTORIAL IS PRINTABLE ……. VIDEO VERSION WILL DEFINITELY ACCELERATE LEARNING…. This is a very good tutorial, comprehensive and with good examples. Very nice and detailed document. Thanks for sharing.